Oneworld’s professionally trained crew are here for you. With over 20 years of combined experience all guests on board Oneworld can rest assured they are in the best possible hands. Born and raised in Sydney it was inevitable that Matt would return to Sydney’s waterways eventually. Having spent the better part of 15 years in Europe as a captain on charter and private yachts he brings with him the highest possible standard he expects of his crew and a level of service for his guests that rival his European counterparts. Spending most of your childhood and adult life on the water means you get to know your cruising ground pretty well and Matt’s wealth of knowledge doesn’t stop at Sydney. The Whitsundays for a long time he called home taking guests from Airlie Beach to the surrounding Islands, Whitehaven Beach and the Outer Great Barrier Reef. With Oneworld’s cruising schedule no one is more perfect to show you all the places you’ve heard of but even more you haven’t. Growing up in New Zealand Hannah’s memory of the ocean was a stark contrast to that of her Australian crew. Wild and unforgiving oceans meant yachting rarely made its way South of the country where she called home. In 2007 that all changed when like many kiwis she crossed the ditch and in 2010 her love for all things yachting took a turn for the better. 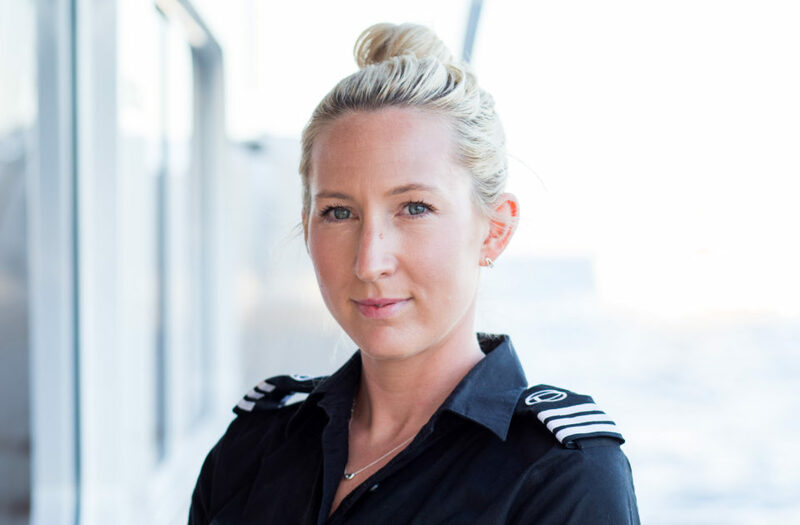 Starting her career in the Whitsundays Hannah has a deep love for the ocean and everything that calls it home. In 2013 she took another leap and entered into the infamous European yachting industry. 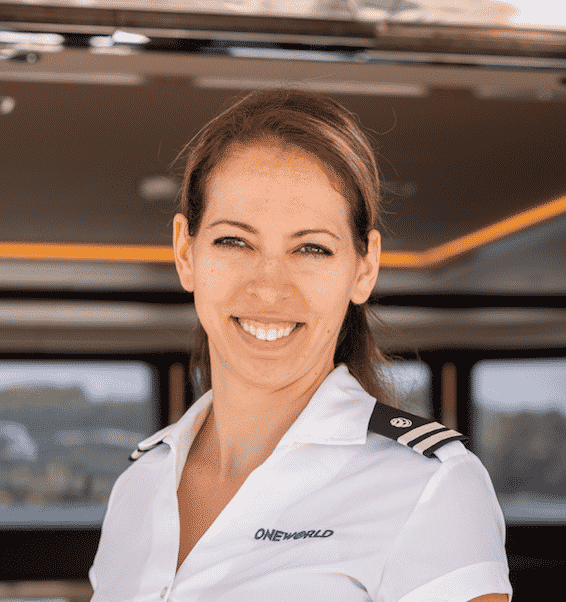 Working in Europe on private and charter yachts Hannah has built such a high expectation for herself and her interior staff nothing but the best will do for her guests. Whether it be hosting a cocktail party or creating memories term charter guests will never forget anyone looking at chartering Oneworld in the future can rest assured they are in the best of hands. 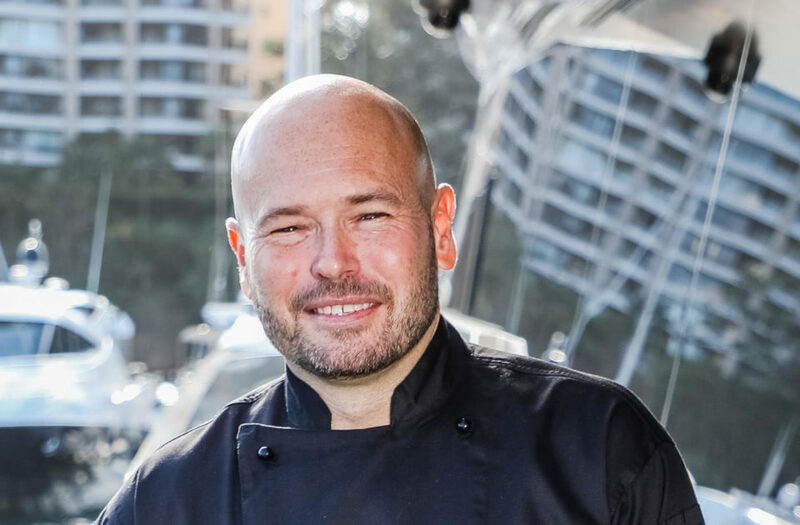 Clancy Atkinson is regarded as one of Australiaʼs leading private chefs. Having worked with several high profile chefs across Australia, Clancy formalised his training in Brisbane under acclaimed chef Russell Armstrong. After moving to Sydney in 2000 Clancy became head chef at the acclaimed Macleay St Bistro then Executive chef and partner in bespoke catering company Plated. Clancy has worked extensively with luxury brands including Louis Vuitton, Giorgio Armani, Audi, Swarovski and Yves St Laurent. concentrates on working with closely with clients offering relaxed, professional and personable service. 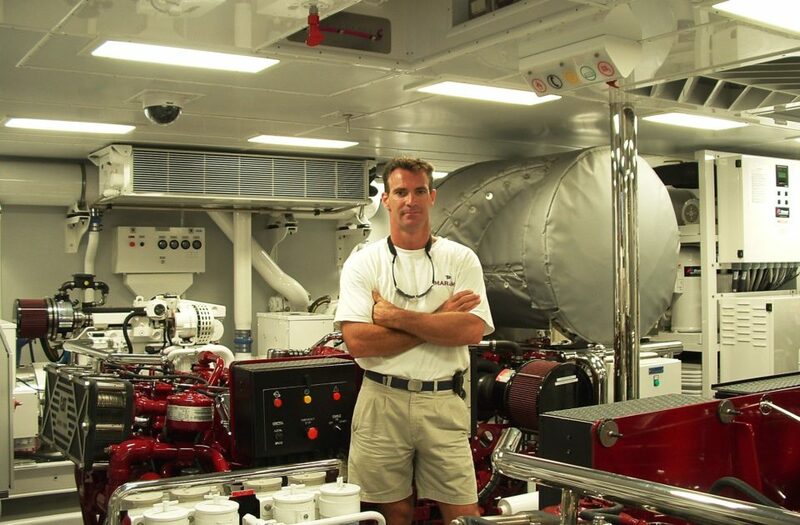 After an introduction to marine diesel engines and the marine environment in general, Guy has never looked back. His career took a substantial turn approximately 20 years ago when he was employed as an engineer with one of Australia’s premier marine tourism companies, running a fleet of large passenger carrying power vessels, operating in the Great Barrier Reef and Whitsunday regions of Queensland. 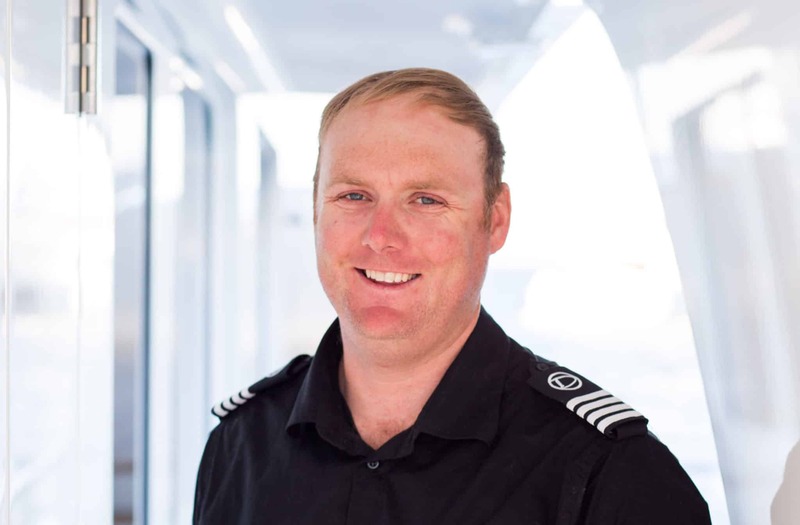 Guy quickly progressed to luxury yachts and continued to advance his career, gaining Engineering and Master qualifications, which has enabled him to act in a dual role as Mate / Engineer and Chief Engineer on a number of Australian flagged and foreign flagged luxury motor yachts and expedition vessels. Guys time at sea has seen him voyage to extremely remote destinations in Australia and the West Pacific, including many locations between Arnhem Land to the North and Tasmania to the South, with a number of long range voyages to the island nations of New Zealand, New Caledonia, Fiji and Vanuatu. Eddie grew up in South East London and from an early age loved the thought of travelling far and wide. Realizing his passion for travelling and experiencing new cultures Eddie decided to go backpacking around Australia, this is where he had his first experience working out at sea and instantly fell in love with the ocean. His first job on the water was out of Broome on a dive boat collecting pearls; after completing two seasons he decided to move to New Zealand and worked on boats out there for a year. Realizing that being on the water is where he wanted to be Eddie moved back to Europe to work on Super Yachts. Working on yachts in Europe taught Eddie how to maintain and respect boats; he has gained experience at the highest example and takes pride in showing his skills on every new boat he works on. After working on Yachts for 2 years in Europe he has moved back to Australia to work on Yachts as he finds the landscape and ocean breath taking.